DIRECTIONS for Questions 1 to 25: Each of the five passages given below is followed by five questions. Choose the best answer to each question. At the heart of the enormous boom in wine consumption that has taken place in the English speaking world over the last two decades or so is a fascinating, happy paradox. In the days when wine was exclusively the preserve of a narrow cultural elite, bought either at auctions or from gentleman wine merchants in wing collars and bow-ties, to be stored in rambling cellars and decanted to order by one’s butler, the ordinary drinker didn’t get a look-in. Wine was considered a highly technical subject, in which anybody without the necessary ability could only fall flat on his or her face in embarrassment. It wasn’t just that you needed a refined aesthetic sensibility for the stuff if it wasn’t to be hopelessly wasted on you. It required an intimate knowledge of what came from where, and what it was supposed to taste like. Those were times, however, when wine appreciation essentially meant a familiarity with the great French classics, with perhaps a smattering of other wines — like sherry and port. That was what the wine trade dealt in. These days, wine is bought daily in supermarkets and high-street chains to be consumed that evening, hardly anybody has a cellar to store it in and most don’t even possess a decanter. Above all, the wines of literally dozens of countries are available in our market. When a supermarket offers its customers a couple of fruity little numbers from Brazil, we scarcely raise an eyebrow. It seems, in other words, that the commercial jungle that wine has now become has not in the slightest deterred people from plunging adventurously into the thickets in order to taste and see. Consumers are no longer intimidated by the thought of needing to know their Pouilly-Fume from their Pouilly-Fuisse, just at the very moment when there is more to know than ever before. The reason for this new mood of confidence is not hard to find. It is on every wine label from Australia, New Zealand, South Africa and the United States: the name of the grape from which the wine is made. At one time that might have sounded like a fairly technical approach in itself. Why should native English-speakers know what Cabernet Sauvignon or Chardonnay were? The answer lies in the popularity that wines made from those grape varieties now enjoy. Consumer effectively recognize them as brand names, and have acquired a basic lexicon of wine that can serve them even when confronted with those Brazilian upstarts. In the wine heartlands of France, they are scared to death of that trend—not because they think their wine isn’t as good as the best from California or South Australia (what French winemaker will ever admit that?) but because they don’t traditionally call their wines Cabernet Sauvignon or Chardonnay. They call them Chateau Ducru Beaucaillou or Corton-Charlemagne, and they aren’t about the change. Some areas, in the middle of southern France, have now produced a generation of growers using the varietal names on their labels and are tempting consumers back to French wine. It will be an uphill struggle, but there is probably no other way if France is to avoid simply becoming a specialty source of old-fashioned wines for old- fashioned connoisseurs. 2. What according to the author should the French do to avoid becoming a producer of merely old- fashioned wines? (a) tendency not to name wines after the grape varieties that are used in the wines. (b) ‘education’ that consumers have derived from wine labels from English speaking countries. (c) new generation of local winegrowers who use labels that show names of grape varieties. (d) ability of consumers to understand a wine’s qualities when confronted with “Brazilian upstarts”. 4. Which one of the following, if true, would provide most support for Dr. Renaud’s findings about the effect of tannins? (a) A survey showed that film celebrities based in France have a low incidence of coronary heart disease. (b) Measurements carried out in southern France showed red wine drinkers had significantly higher levels of coronary heart incidence than white wine drinkers did. (c) Data showed a positive association between sales of red wine and incidence of coronary heart disease. (d) Long-term surveys in southern France showed that the incidence of coronary heart disease was significantly lower in red wine drinkers than in those who did not drink red wine. 5. Which one of the following CANNOT be reasonably attributed to the labeling strategy followed by wine producers in English speaking countries? (a) Consumers buy wines on the basis of their familiarity with a grape variety’s name. (b) Even ordinary customers now have more access to technical knowledge about wine. (c) Consumers are able to appreciate better quality wines. (d) Some non-English speaking countries like Brazil indicate grape variety names on their labels. Right through history, imperial powers have clung to their possessions to death. Why, then, did Britain in 1947 give up the jewel in its crown, India? For many reasons. The independence struggle exposed the hollowness of the white man’s burden. Provincial self-rule since 1935 paved the way for full self-rule. Churchill resisted independence, but the Labour government of Atlee was anti-imperialist by ideology. Finally, the Royal Indian Navy mutiny in 1946 raised fears of a second Sepoy mutiny, and convinced British waverers that it was safer to withdraw gracefully. But politico-military explanations are not enough. The basis of empire was always money. The end of empire had much to do with the fact that British imperialism had ceased to be profitable. World War II left Britain victorious but deeply indebted, needing Marshall Aid and loans from the World Bank. This constituted a strong financial case for ending the no-longer profitable empire. Empire building is expensive. The US is spending one billion dollars a day in operations in Iraq that fall well short of full scale imperialism. Through the centuries, empire building was costly, yet constantly undertaken because it promised high returns. The investment was in armies and conquest. The returns came through plunder and taxes from the conquered. No immorality was attached to imperial loot and plunder. The biggest conquerors were typically revered (hence titles like Alexander the Great, Akbar the Great, and Peter the Great). The bigger and richer the empire, the more the plunderer was admired. This mindset gradually changed with the rise of new ideas about equality and governing for the public good, ideas that culminated in the French and American revolutions. Robert Clive was impeached for making a little money on the side, and so was Warren Hastings. The white man’s burden came up as a new moral rationale for conquest. It was supposedly for the good of the conquered. This led to much muddled hypocrisy. On the one hand, the empire needed to be profitable. On the other hand, the white man’s burden made brazen loot impossible. An additional factor deterring loot was the 1857 Sepoy Mutiny. Though crushed, it reminded the British vividly that they were a tiny ethnic group who could not rule a gigantic subcontinent without the support of important locals. After 1857, the British stopped annexing one princely state after another, and instead treated the princes as allies. Land revenue was fixed in absolute terms, partly to prevent local unrest and partly to promote the notion of the white man’s burden. The empire proclaimed itself to be a protector of the Indian peasant against exploitation by Indian elites. This was denounced as hypocrisy by nationalists like Dadabhoy Naoroji in the 19th century, who complained that land taxes led to an enormous drain from India to Britain. Objective calculations by historians like Angus Maddison suggest a drain of perhaps 1.6 percent of Indian Gross National Product in the 19th century. But land revenue was more or less fixed by the Raj in absolute terms, and so its real value diminished rapidly with inflation in the 20th century. By World War II, India had ceased to be a profit center for the British Empire. Historically, conquered nations paid taxes to finance fresh wars of the conqueror. India itself was asked to pay a large sum at the end of World War I to help repair Britain’s finances. But, as shown by historian Indivar Kamtekar, the independence movement led by Gandhiji changed the political landscape, and made mass taxation of India increasingly difficult. By World War II, this had become politically impossible. Far from taxing India to pay for World War II, Britain actually began paying India for its contribution of men and goods. Troops from white dominions like Australia, Canada and New Zealand were paid for entirely by these countries, but Indian costs were shared by the British government. Britain paid in the form of non- convertible sterling balances, which mounted swiftly. The conqueror was paying the conquered, undercutting the profitability on which all empire is founded. Churchill opposed this, and wanted to tax India rather than owe it money. But he was overruled by Indian hands who said India would resist payment, and paralyze the war effort. Leo Amery, Secretary of State for India, said that when you are driving in a taxi to the station to catch a life-or-death train, you do not loudly announce that you have doubts whether to pay the fare. Thus, World War II converted India from a debtor to a creditor with over one billion pounds in sterling balances. Britain, meanwhile, became the biggest debtor in the world. It’s not worth ruling over people you are afraid to tax. 6. Why didn’t Britain tax India to finance its World War II efforts? (a) Australia, Canada and New Zealand had offered to pay for Indian troops. (b) India has already paid a sufficiently large sum during World War I. (c) It was afraid that if India refused to pay, Britain’s war efforts would be jeopardized. (d) The British empire was built on the premise that the conqueror pays the conquered. 7. What was the main lesson the British learned from the Sepoy Mutiny of 1857? (a) That the local princes were allies, not foes. (b) That the land revenue from India would decline dramatically. (c) That the British were a small ethnic group. (d) That India would be increasingly difficult to rule. 8. Which of the following was NOT a reason for the emergence of the ‘white man’s burden’ as a new rationale for empire-building in India? (a) The emergence of the idea of the public good as an element of governance. (b) The decreasing returns from imperial loot and increasing costs of conquest. (c) The weakening of the immorality attached to an emperor’s looting behaviour. (d) A growing awareness of the idea of equality among peoples. 9. Which of the following best captures the meaning of the ‘white man’s burden’, as it is used by the author? (a) The British claim to a civilizing mission directed at ensuring the good of the natives. (b) The inspiration for the French and American revolutions. (c) The resource drain that had to be borne by the home country’s white population. (d) An imperative that made open looting of resources impossible. 10. Which one of the following best expresses the main purpose of the author? (a) To present the various reasons that can lead to the collapse of an empire and the granting of independence of the subjects of an empire. (b) To point out the critical role played by the ‘white man’s burden’ in making a colonizing power give up its claims to native possessions. (c) To highlight the contradictory impulse underpinning empire building which is a costly business but very attractive at the same time. (d) To illustrate how erosion of the financial basis of an empire supports the granting of independence to an empire’s constituents. The controversy over genetically modified food continues unabated in the West. Genetic modification (GM) is the science by which the genetic material of a plant is altered, perhaps to make it more resistant to pests or killer weeds, or to enhance its nutritional value. Many food biotechnologists claim that GM will be a major contribution of science to mankind in the 21st century. On the other hand, large numbers of opponents, mainly in Europe, claim that the benefits of GM are a myth propagated by multinational corporations to increase their profits, that they pose a health hazard, and have therefore called for government to ban the sale of genetically-modified food. The anti-GM campaign has been quite effective in Europe, with several European Union member countries imposing a virtual ban for five years over genetically-modified food imports. Since the genetically-modified food industry is particularly strong in the United States of America, the controversy also constitutes another chapter in the US-Europe skirmishes which have become particularly acerbic after the US invasion of Iraq. To a large extent, the GM controversy has been ignored in the Indian media, although Indian biotechnologists have been quite active in GM research. Several groups of Indian biotechnologists have been working on various issues connected with crops grown in India. One concrete achievement which has recently figured in the news is that of a team led by the former vice-chancellor of Jawaharlal Nehru university, Asis Datta — it has successfully added an extra gene to potatoes to enhance the protein content of the tuber by at least 30 percent. It is quite likely that the GM controversy will soon hit the headlines in India since a spokesperson of the Indian Central government has recently announced that the government may use the protato in its midday meal programme for schools as early as next year. Why should “scientific progress”, with huge potential benefits to the poor and malnourished, be so controversial? The anti-GM lobby contends that pernicious propaganda has vastly exaggerated the benefits of GM and completely evaded the costs which will have to be incurred if the genetically-modified food industry is allowed to grow unchecked. In particular, they allude to different types of costs. This group contends that the most important potential cost is that the widespread distribution and growth of genetically-modified food will enable the corporate world (alias the multinational corporations – MNCs) to completely capture the food chain. A “small” group of biotech companies will patent the transferred genes as well as the technology associated with them. They will then buy up the competing seed merchants and seed-breeding centers, thereby controlling the production of food at every possible level. Independent farmers, big and small, will be completely wiped out of the food industry. At best, they will be reduced to the status of being subcontractors. The second type of cost associated with the genetically modified food industry is environmental damage. The most common type of “genetic engineering” involved gene modification in plants designed to make them resistant to applications of weed-killers. This then enables farmers to use massive dosages of weed- killers so as to destroy or wipe out all competing varieties of plants in their field. However, some weeds through genetically-modified pollen contamination may acquire resistance to a variety of weed-killers. The only way to destroy these weeds is through the use of ever-stronger herbicides which are poisonous and linger on in the environment. (a) MNCs will focus on high-value food items. (b) MNCs are driven by the motive of profit maximization. (c) MNCs are not the only group of actors in genetically-modified food research. (d) Economic development will help the poor buy MNC-produced food. 12. Using the clues in the passage, which of the following countries would you expect to be in the forefront of the anti-GM campaign? (d) Australia and New Zealand. (a) wiping out competing varieties of plants which now fall prey to killer weeds. (b) forcing application of stronger herbicides to kill weeds which have become resistant to weak herbicides. (c) forcing application of stronger herbicides to keep the competing plants weed-free. (d) not allowing growth of any weeds, thus reducing soil fertility. (a) is of utility only for high value food items. (b) is funded only by multinational corporations. (c) allows multinational corporations to control the food basket of the poor. (d) addresses the concerns of rich and poor countries. 15. Which of the following about the Indian media’s coverage of scientific research does the passage seem to suggest? (a) Indian media generally covers a subject of scientific importance when its mass application is likely. (b) Indian media’s coverage of scientific research is generally dependent on MNCs interests. (c) Indian media, in partnership with the government, is actively involved in publicizing the results of scientific research. (d) Indian media only highlights scientific research which is funded by the government. Social life is an outflow and meeting of personality, which means that its end is the meeting of character, temperament, and sensibility, in which our thoughts and feelings, and sense perceptions are brought into play at their lightest and yet keenest. This aspect, to my thinking, is realized as much in large parties composed of casual acquaintances or even strangers, as in intimate meetings of old friends. I am not one of those superior persons who hold cocktail parties in contempt, looking upon them as barren or at best as very tryingly kaleidoscopic places for gathering, because of the strangers one has to meet in them; which is no argument, for even our most intimate friends must at one time have been strangers to us. These large gatherings will be only what we make of them if not anything better, they can be as good places to collect new friends from as the slave- markets of Istanbul were for beautiful slaves or New Market for race horses. But they do offer more immediate enjoyment. For one thing, in them one can see the external expression of social life in appearance and behaviour at its widest and most varied, where one can admire beauty of body or air, hear voices remarkable either for sweetness of refinement, look on elegance of clothes or deportment. What is more, these parties are schools for training in sociability, for in them we have to treat strangers as friends. So, in them we see social sympathy in widest commonality spread, or at least should. We show an atrophy of the natural human instinct of getting pleasure and happiness out of other human beings if we cannot treat strangers as friends for the moment. And I would go further and paraphrase Pater to say that not to be able to discriminate every moment some passionate attitude in those about us, even when we meet them casually, is on this short day of frost and sun which out life is, to sleep before evening. So, it will be seen that my conception of social life is modest, for it makes no demands on what we have, though it does make some on what we are. Interest, wonder, sympathy, and love, the first two leading to the last two, are the psychological prerequisites for social life; and the need for the first two must not be underrated. We cannot make the most even of our intimate social life unless we are able to make strangers of our oldest friends everyday by discovering unknown areas in their personality, and transform them into new friends. In sum, social life is a function of vitality. It is tragic, however, to observe that it is these very natural springs of social life which are drying up among us. It is becoming more and more difficult to come across fellow-feeling for human beings as such in our society and in all its strata. In the poor middle class, in the course of all my life. I have hardly seen any social life properly so-called. Not only has the grinding routine of making a living killed all desire for it in them, it has also generated a standing mood of peevish hostility to other human beings. Increasing economic distress in recent years has infinitely worsened this state of affairs, and has also brought a sinister addition class hatred. This has become the greatest collective emotional enjoyment of the poor middle class, and indeed they feel most social when they form a pack, and snarl or howl at people who are better off than they. Their most innocent exhibition of sociability is seen when they spill out from their intolerable homes into the streets and bazaars. I was astonished to see the milling crowds in the poor suburbs of Calcutta. But even there a group of flippant young loafers would put on a conspiratorial look if they saw a man in good clothes passing by them either on foot or in a car. I had borrowed a car from a relative to visit a friend in one of these suburbs, and he became very anxious when I had not returned before dusk. Acid and bombs, he said, were thrown at cars almost every evening in that area. I was amazed. But I also know as a fact that my brother was blackmailed to pay five rupees on a trumped up charge when passing in a car through one such locality. The situation is differently inhuman, but not a whit more human, among the well-to-do. Kindliness for fellow human beings has been smothered in them, taken as a class, by the arrogance of worldly position, which among the Bengalis who show this snobbery is often only a third-class position. (a) Large parties consisting of casual acquaintances and strangers. (b) Intimate meetings of old friends. (d) Both (1) and (2). (a) showing how shallow our social life is. (b) poking fun at the lower middle class people who howl at better off people. (c) lamenting the drying up of our real social life. (d) criticizing the upper class for lavish showy parties. (a) people attend large gatherings. (b) people possess qualities like wonder and interest. (c) people do not spend too much time in the company of intimate friends. (d) large parties consist of casual acquaintances and intimate friends. 20. What is the author trying to show through the two incidents in the paragraph beginning, “Their most innocent exhibition of sociability…”? (a) The crowds in poor Calcutta suburbs can turn violent without any provocation. (b) Although poor, the people of poor Calcutta suburbs have a rich social life. (c) It is risky for rich people to move around in poor suburbs. (d) Achieving a high degree of sociability does not stop the poor from hating the rich. Modern science, exclusive of geometry, is a comparatively recent creation and can be said to have originated with Galileo and Newton. Galileo was the first scientist to recognize clearly that the only way to further our understanding of the physical world was to resort to experiment. However obvious Galileo’s contention may appear in the light of our present knowledge, it remains a fact that the Greeks, in spite of their proficiency in geometry, never seem to have realized the importance of experiment. To a certain extent, this may be attributed to the crudeness of their instruments of measurement. Still an excuse of this sort can scarcely be put forward when the elementary nature of Galileo’s experiments and observations is recalled. Watching a lamp oscillate in the cathedral of Pisa, dropping bodies from the leaning tower of Pisa, rolling balls down inclined planes, noticing the magnifying effect of water in a spherical glass vase, such was the nature of Galileo’s experiments and observations. As can be seen, they might just as well have been performed by the Greeks. At any rate, it was thanks to such experiments that Galileo discovered the fundamental law of dynamics, according to which the acceleration imparted to a body is proportional to the force acting upon it. The next advance was due to Newton, the greatest scientist of all time if account be taken of his joint contributions to mathematics and physics. As a physicist, he was of course an ardent adherent of the empirical method, but his greatest title to fame lies in another direction. Prior to Newton, mathematics, chiefly in the form of geometry, had been studied as a fine art without any view to its physical applications other than in very trivial cases. But with Newton all the resources of mathematics were turned to advantage in the solution of physical problems. Thenceforth, mathematics appeared as an instrument of discovery, the most powerful one known to man, multiplying the power of thought just as in the mechanical domain the lever multiplied our physical action. It is this application of mathematics to the solution of physical problems, this combination of two separate fields of investigation, which constitutes the essential characteristic of the Newtonian method. Thus, problems of physics were metamorphosed into problems of mathematics. But in Newton’s day the mathematical instrument was still in a very backward state of development. In this field again Newton showed the mark of genius by inventing the integral calculus. As a result of this remarkable discovery, problems, which would have baffled Archimedes, were solved with ease. We know that in Newton’s hands this new departure in scientific method led to the discovery of the law of gravitation. But here again the real significance of Newton’s achievement lay not so much in the exact quantitative formulation of the law of attraction, as in his having established the presence of law and order at least in one important realm of nature, namely, in the motions of heavenly bodies. Nature thus exhibited rationality and was not mere blind chaos and uncertainty. To be sure, Newton’s investigations had been concerned with but a small group of natural phenomena, but it appeared unlikely that this mathematical law and order should turn out to be restricted to certain special phenomena; and the feeling was general that all the physical processes of nature would prove to be unfolding themselves according to rigorous mathematical laws. When Einstein, in 1905, published his celebrated paper on the electrodynamics of moving bodies, he remarked that the difficulties, which surrounded the equations of electrodynamics, together with the negative experiments of Michelson and others, would be obviated if we extended the validity of the Newtonian principle of the relativity of Galilean motion, which applies solely to mechanical phenomena, so as to include all manner of phenomena: electrodynamics, optical etc. When extended in this way the Newtonian principle of relativity became Einstein’s special principle of relativity. Its significance lay in its assertion that absolute Galilean motion or absolute velocity must ever escape all experimental detection. Henceforth absolute velocity should be conceived of as physically meaningless, not only in the particular realm of mechanics, as in Newton’s day, but in the entire realm of physical phenomena. Einstein’s special principle, by adding increased emphasis to this relativity of velocity, making absolute velocity metaphysically meaningless, created a still more profound distinction between velocity and accelerated or rotational motion. This latter type of motion remained absolute and real as before. It is most important to understand this point and to realize that Einstein’s special principle is merely an extension of the validity of the classical Newtonian principle to all classes of phenomena. 21. According to the author, why did the Greeks NOT conduct experiments to understand the physical world? (a) Apparently they did not think it necessary to experiment. (b) They focused exclusively on geometry. (c) Their instruments of measurement were very crude. (d) The Greeks considered the application of geometry to the physical world more important. (a) problems that had baffled scientists like Archimedes were not really problems. (b) only a small group of natural phenomena was chaotic. (c) physical phenomena conformed to mathematical laws. (d) natural phenomena were evolving towards a less chaotic future. (a) discovered the law of gravitation. (b) married physics with mathematics. (d) started the use of the empirical method in science. 24. Which of the following statements about modern science best captures the theme of the passage? (a) Modern science rests firmly on the platform built by the Greeks. (b) We need to go back to the method of enquiry used by the Greeks to better understand the laws of dynamics. (c) Disciplines like Mathematics and Physics function best when integrated into one. (d) New knowledge about natural phenomena builds on existing knowledge. (a) absolute velocity was meaningless in the realm of mechanics. (b) Newton’s principle of relativity needs to be modified. (c) there are limits to which experimentation can be used to understand some physical phenomena. (d) it is meaningless to try to understand the distinction between velocity and accelerated or rotational motion. DIRECTIONS for Questions 26 to 30: The poem given below is followed by five questions. Choose the best answer to each question. 26. Which of the following best reflects the central theme of this poem? (a) If you don’t have high expectations, you will not be disappointed. (b) Don’t rush to your goal; the journey is what enriches you. (c) The longer the journey the greater the experiences you gather. (d) You cannot reach Ithaka without visiting Egyptian ports. 27. The poet recommends a long journey. Which of the following is the most comprehensive reason for it? (a) You can gain knowledge as well as sensual experience. (b) You can visit new cities and harbours. (c) You can experience the full range of sensuality. (d) You can buy a variety of fine things. (c) the path to wisdom. 29. What does the poet mean by ‘Laistrygonians’ and ‘Cyclops’? (a) Creatures which, along with Poseidon, one finds during a journey. (b) Mythological characters that one should not be afraid of. (c) Intra-personal obstacles that hinder one’s journey. (d) Problems that one has to face to derive the most from one’s journey. 30. Which of the following best reflects the tone of the poem? DIRECTIONS for Questions 31 to 35: In each of the questions, four different ways of presenting an idea are given. Choose the one that conforms most closely to Standard English usage. B. The heightened focus on controlling the body and emotions comes from disdain and self- consciousness about the body and its products, found in the sixteenth century. DIRECTIONS for Questions 36 to 40: The sentences given in each question, when properly sequenced, form a coherent paragraph. Each sentence is labeled with a letter. Choose the most logical order of sentences from among the given choices to construct a coherent paragraph. B. I would go to sleep in my hotel room around midnight each night, and when I awoke, my mailbox would be full of replies—sent at 1:15 a.m., 2:59 a.m., 3:23 a.m.
C. One senior told me that she went to bed around two and woke up each morning at seven; she could afford that much rest because she had learned to supplement her full day of work by studying in her sleep. D. Faculty members gave me the names of a few dozen articulate students, and I sent them e-mails, inviting them out to lunch or dinner in small groups. E. As she was falling asleep she would recite a math problem or a paper topic to herself; she would then sometimes dream about it, and when she woke up, the problem might be solved. A. Four days later, Oracle announced its own bid for PeopleSoft, and invited the firm’s board to a discussion. B. Furious that his own plans had been endangered, PeopleSoft’s boss, Craig Conway, called Oracle’s offer “diabolical”, and its boss, Larry Ellison, a “sociopath”. C. In early June, PeopleSoft said that it would buy J.D. Edwards, a smaller rival. E. On June 12th, PeopleSoft turned Oracle down. B. How can then one characterize a conflict to be waged against a phenomenon as war? C. The phrase ‘war against terror’, which has passed into the common lexicon, is a huge misnomer. D. Besides, war has a juridical meaning in international law, which has codified the laws of war, imbuing them with a humanitarian content. E. Terror is a phenomenon, not an entity—either State or non-State. B. Then you come across the unpleasant human animal—the District Officer who drawled, ‘We chaps are here to help you chaps,’ and then proceeded to be as obstructive as possible. C. In these cases of course, the fact that you are an animal collector helps; people always seem delighted to meet someone with such an unusual occupation and go out of their way to assist you. D. Fortunately, these types are rare, and the pleasant ones I have met more than compensated for them—but even so, I think I will stick to animals. E. When you travel round the world collecting animals you also, of necessity, collect human beings. C. The QWERTY design (patented by Christopher Sholes in 1868 and sold to Remington in 1873) aimed to solve a mechanical problem of early typewriters. D. Yet the Dvorak layout has never been widely adopted, even though (with electric typewriters and then PCs) the anti-jamming rational for QWERTY has been defunct for years. E. When certain combinations of keys were struck quickly, the type bars often jammed. DIRECTIONS for Questions 41 to 45: In each question, the word at the top of the table is used in four different ways, numbered 1 to 4. Choose the option in which the usage of the word is INCORRECT or INAPPROPRIATE. (a) The newborn baby was a bundle of joy for the family. (b) Mobile operators are offering a bundle of additional benefits. (c) He made a bundle in the share market. (d) It was sheer luck that brought a bundle of boy-scouts to where I was lying wounded. (a) He is distinct about what is right and what is wrong. (b) Mars became distinct on the horizon in the month of August. (c) The distinct strains of Ravi’s violin could be heard above the general din. (d) Ghoshbabu’s is a distinct case of water rising above its own level. (a) Everyone appreciated the headmaster’s implication in raising flood relief in the village. (b) This letter will lead to the implication of several industrialists in the market scam. (c) Several members of the audience missed the implication of the minister’s promise. (d) Death, by implication, is the only solution the poem offers the reader. (a) If you host the party, who will foot the bill? (c) Ranchi will play the host to the next national film festival. (d) A virus has infected the host computer. (a) W hat sort of cheese do you use in pizza? (b) Farmers of all sort attended the rally. (c) They serve tea of a sort on these trains. (d) Let’s sort these boys into four groups. DIRECTIONS for Questions 46 to 50: There are two gaps in each of the following sentences. From the pairs of words given, choose the one that fills the gaps most appropriately. The first word in the pair should fill the first gap. 46. The British retailer, M&S, today formally_____ defeat in its attempt to____ King’s, its US subsidiary, since no potential purchasers were ready to cough up the necessary cash. 47. Early____ of maladjustment to college culture is _____by the tendency to develop friendship networks outside college which mask signals of maladjustment. 48. The ____regions of Spain all have unique cultures, but the____ views within each region make the issue of an acceptable common language of instruction an even more contentious one. 49. A growing number of these expert professionals_____ having to train foreigners as the students end up the teachers who have to then unhappily contend with no jobs at all or new jobs with drastically reduced pay packets. 50. Companies that try to improve employees’ performance by ____rewards encourage negative kinds of behavior instead of______ a genuine interest in doing the work well. DIRECTIONS for Questions 51 to 53: In each question, there are two statements: A and B, either of which can be true or false on the basis of the information given below. A research agency collected the following data regarding the admission process of a reputed manage- ment school in India. 51. Statement A: The success rate of moving from written test to interview stage for males was worse than for females in 2003. Statement B: The success rate of moving from written test to interview stage for females was better in 2002 than in 2003. 52. Statement A: In 2002, the number of females selected for the course as a proportion of the number of females who bought application forms, was higher than the corresponding proportion for males. Statement B: In 2002, among those called for interview, males had a greater success rate than females. 53. Statement A: The percentage of absentees in the written test among females decreased from 2002 to 2003. Statement B: The percentage of absentees in the written test among males was larger than among females in 2003. DIRECTIONS for Questions 54 to 57: Answer the questions on the basis of the information given below. The length of an infant is one of the measures of his/her development in the early stages of his/her life. 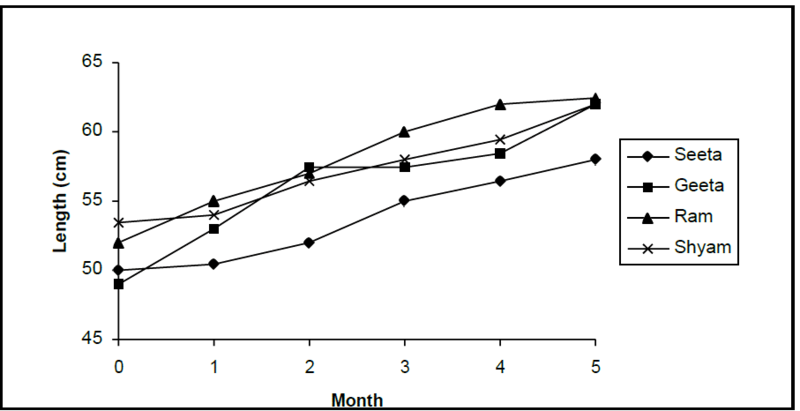 The figure below shows the growth chart of four infants in the first five months of life. 54. After which month did Seeta’s rate of growth start to decline? 55. Who grew at the fastest rate in the first two months of life? 57. Among the four infants, who grew the least in the first five months of life? DIRECTIONS for Questions 58 to 60: Answer the questions on the basis of the information given below. The table below provides certain demographic details of 30 respondents who were part of a survey. The demographic characteristics are: gender, number of children, and age of respondents. The first number in each cell is the number of respondents in that group. The minimum and maximum age of respondents in each group is given in brackets. For example, there are five female respondents with no children and among these five, the youngest is 34 years old, while the oldest is 49. DIRECTIONS for Questions 61 to 63: Answer the questions on the basis of the information given below. Spam that enters our electronic mailboxes can be classified under several spam heads. The following table shows the distribution of such spam worldwide over time. The total number of spam emails received during December 2002 was larger than the number received in June 2003. The total number of spam emails received during September 2002 was larger than the number received in March 2003. The figures in the table represent the percentage of all spam emails received during that period, falling into those respective categories. 61. In which category was the percentage of spam emails increasing but at a decreasing rate? 62. In the health category, the number of spam emails received in December 2002 as compared to June 2003. 63. In the financial category, the number of spam emails received in September 2002 as compared to March 2003. DIRECTIONS for Questions 64 to 66: Answer the questions on the basis of the information given below. One of the functions of the Reserve Bank of India is to mobilize funds for the Government of India by issuing securities. 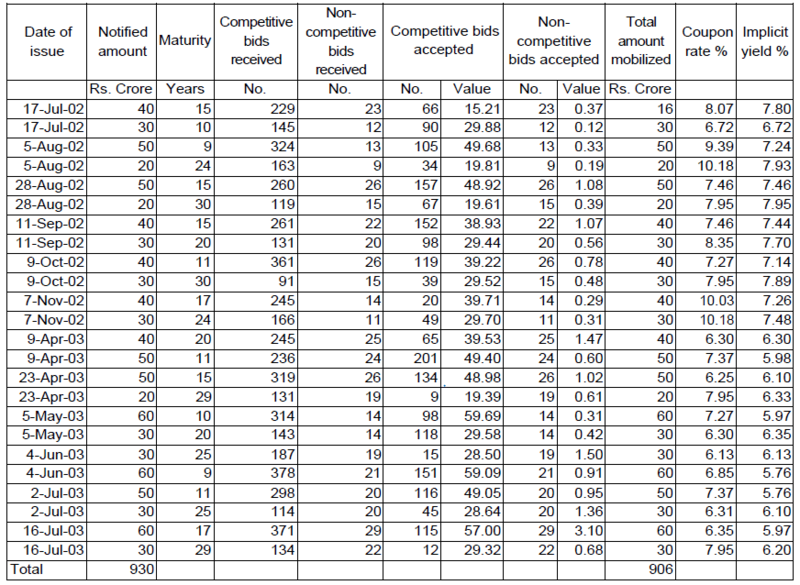 The following table shows details of funds mobilized during the period July 2002 – July 2003. Notice that on each date there were two rounds of issues, each with a different maturity. 64. How many times was the issue of securities under-subscribed, i.e., how often did the total amount mobilized fall short of the amount notified? (a) The second round issues have a higher maturity than the first round for all dates. (b) The second round issue of any date has a lower maturity only when the first round notified amount exceeds that of the second round. (c) On at least one occasion, the second round issue having lower maturity received a higher number of competitive bids. (d) None of the above three statements is true. 66. Which of the following statements is NOT true? (a) Competitive bids received always exceed non-competitive bids received. (b) The number of competitive bids accepted does not always exceed the number of non-competitive bids accepted. (c) The value of competitive bids accepted on any particular date is never higher for higher maturity. (d) The value of non-competitive bids accepted in the first round is always greater than that in the second round. DIRECTIONS for Questions 67 to 69: Answer the questions on the basis of the information given below. 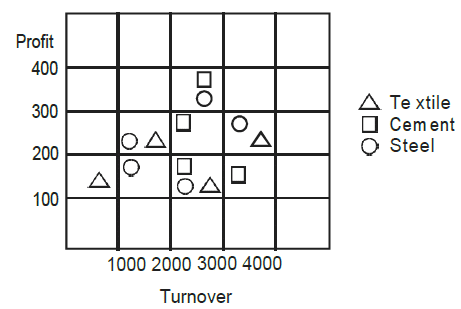 Each point in the graph below shows the profit and turnover data for a company. Each company belongs to one of the three industries: textile, cement and steel. 67. For how many companies does the profit exceed 10% of turnover? 68. For how many steel companies with a turnover of more than 2000 is the profit less than 300? 69. An investor wants to buy stock of only steel or cement companies with a turnover more than 1000 and profit exceeding 10% of turnover. How many choices are available to the investor? DIRECTIONS for Questions 70 to 72: Answer the questions on the basis of the information given below. 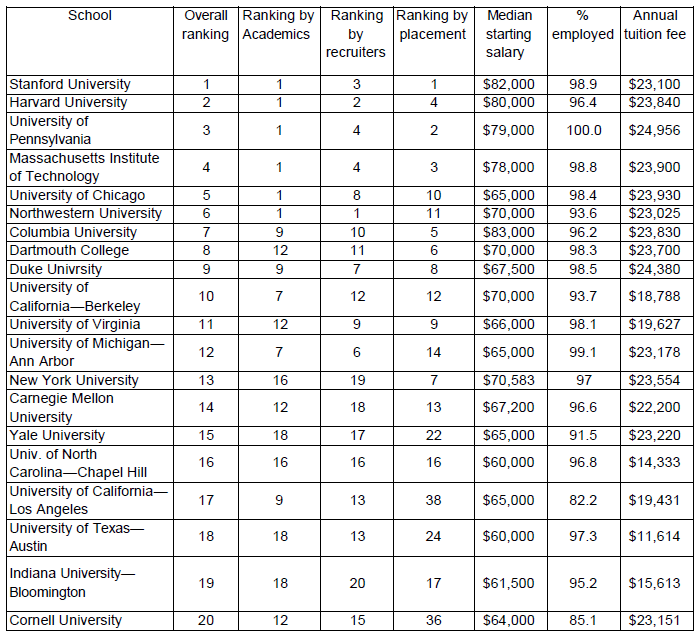 Details of the top 20 MBA schools in the US as ranked by US News and World Report, 1997 are given below. 70. Madhu has received admission in all schools listed above. She wishes to select the highest overall ranked school whose a) annual tuition fee does not exceed $23,000 and b) median starting salary is at least $70,000. Which school will she select? 71. In terms of staring salary and tuition fee, how many schools are uniformly better (higher median starting salary AND lower tuition fee) than Dartmouth College? 72. How many schools in the list above have single digit rankings on at least 3 of the 4 parameters (overall ranking, ranking by academics, ranking by recruiters and ranking by placement)? DIRECTIONS for Questions 73 to 75: Answer the questions on the basis of the information given below. Table A below provides data about ages of children in a school. For the age given in the first column, the second column gives the number of children not exceeding the age. For example, first entry indicates that there are 9 children aged 4 years or less. Tables B and C provide data on the heights and weights respectively of the same group of children in a similar format. Assuming that an older child is always taller and weighs more than a younger child, answer the following questions. 73. What is the number of children of age 9 years of less whose height does not exceed 135 cm? 74. How many children of age more than 10 years are taller than 150 cm and do not weigh more than 48 kg? 75. Among the children older than 6 years but not exceeding 12 years, how many weigh more than 38 kg.? DIRECTIONS for Questions 76 to 77: Answer the questions on the basis of the information given below. An industry comprises four firms (A, B, C, and D). Financial details of these firms and of the industry as a whole for a particular year are given below. Profitability of a firm is defined as profit as a percentage of sales. 76. Which firm has the highest profitability? 77. If firm A acquires firm B, approximately what percentage of the total market (total sales) will they corner together? DIRECTIONS for Questions 78 to 80: Answer the questions on the basis of the information given below. 78. Which of the following is one of the married couples? 79. What is E’s profession? 80. How many members of the group are males? DIRECTIONS for Questions 81 and 82: Answer the questions on the basis of the information given below. 81. Which is a valid assignment? (a) A-Home, B-Power, C-Defence, D-Telecom, E-Finance. (b) C-Home, D-Power, A-Defence, B-Telecom, E-Finance. (c) A-Home, B-Power, E-Defence, D-Telecom, F-Finance. (d) B-Home, F-Power, E-Defence, C-Telecom, A-Finance. 82. If A gets Home and C gets Finance, then which is NOT a valid assignment of Defense and Telecom? DIRECTIONS for Questions 83 to 85: Answer the questions on the basis of the information given below. (a) Rs. 19.50 per litre. (c) Rs. 20.00 per litre. (d) Rs. 20.25 per litre. (a) CREAM and RED in the ratio 14:10. (b) CREAM and RED in the ratio 3:1. (c) YELLOW and PINK in the ratio 1:1. (d) RED, YELLOW, and WHITE in the ratio 1:1:2. 85. Assume that AVOCADO, CREAM and WASHEDORANGE each sells for the same price. Which of the three is the most profitable to manufacture? (d) Sufficient data is not available. DIRECTIONS for Questions 86 to 88: Answer the questions on the basis of the information given below. Seven varsity basketball players (A, B, C, D, E, F, and G) are to be honoured at a special luncheon. The players will be seated on the dais in a row. A and G have to leave the luncheon early and so must be seated at the extreme right. B will receive the most valuable player’s trophy and so must be in the centre to facilitate presentation. C and D are bitter rivals and therefore must be seated as far apart as possible. 86. Which of the following cannot be seated at either end? 87. Which of the following pairs cannot be seated together? 88. Which of the following pairs cannot occupy the seats on either side of B? DIRECTIONS for Questions 89 to 92: In each question there are two statements: A and B. Choose (1) if the question can be answered by one of the statements alone but not by the other. Choose (2) if the question can be answered by using either statement alone. Choose (3) if the question can be answered by using both the statements together but cannot be answered using either statement alone. Choose (4) if the question cannot be answered even by using both the statements A and B. 89. F and M are father and mother of S, respectively. S has four uncles and three aunts. F has two siblings. The siblings of F and M are unmarried. How many brothers does M have? A. F has two brothers. B. M has five siblings. 90. A game consists of tossing a coin successively. There is an entry fee of Rs. 10 and an additional fee of Re. 1 for each toss of coin. The game is considered to have ended normally when the coin turns heads on two consecutive throws. In this case the player is paid Rs. 100. Alternatively, the player can choose to terminate the game prematurely after any of the tosses. Ram has incurred a loss of Rs. 50 by playing this game. How many times did he toss the coin? A. The game ended normally. B. The total number of tails obtained in the game was 138. 91. Each packet of SOAP costs Rs. 10. Inside each packet is a gift coupon labelled with one of the letters S, O, A and P. If a customer submits four such coupons that make up the word SOAP, the customer gets a free SOAP packets. Ms. X kept buying packet after packet of SOAP till she could get one set of coupons that formed the word SOAP. How many coupons with label P did she get in the above process? A. The last label obtained by her was S and the total amount spent was Rs. 210. B. The total number of vowels obtained was 18. 92. If A and B run a race, then A wins by 60 seconds. If B and C run the same race, then B wins by 30 seconds. Assuming that C maintains a uniform speed what is the time taken by C to finish the race? A. A and C run the same race and A wins by 375 metres. B. The length of the race is 1 km. DIRECTIONS for Questions 93 to 94: Answer the questions on the basis of the information given below. (a) Ramesh shot 18 baskets and Dhanraj shot 19 baskets. (b) Ganesh shot 24 baskets and Ashish shot 16 baskets. (c) Jugraj shot 19 baskets and Dhanraj shot 27 baskets. (d) Dhanraj shot 11 baskets and Ashish shot 16 baskets. 94. Which of the following statements is true? (a) Dhanraj and Jugraj together shot 46 baskets. (b) Ganesh shot 18 baskets and Ramesh shot 21 baskets. (c) Dhanraj shot 3 more baskets than Ramesh. (d) Ramesh and Jugraj together shot 29 baskets. DIRECTIONS for Questions 95 to 97: Answer the questions on the basis of the information given below. Five women decided to go shopping to M.G. Road, Bangalore. They arrived at the designated meeting place in the following order: 1. Archana, 2. Chellamma, 3. Dhenuka, 4. Helen, and 5. Shahnaz. Each woman spent at least Rs. 1000. Below are some additional facts about how much they spent during their shopping spree. 95. What was the amount spent by Helen? 96. Which of the following amounts was spent by one of them? DIRECTIONS for Questions 98 to 100: Answer the questions on the basis of the information given below. Five friends meet every morning at Sree Sagar restaurant for an idli-vada breakfast. Each consumes a different number of idlis and vadas. The number of idlis consumed are 1, 4, 5, 6, and 8, while the number of vadas consumed are 0, 1, 2, 4, and 6. Below are some more facts about who eats what and how much. 98. Which one of the following statements is true? (c) Bimal eats 1 idli. (d) Bimal eats 6 idlis. 99. Which of the following statements is true? (a) Sandeep eats 2 vadas. (b) Mukesh eats 4 vadas. (c) Ignesh eats 6 vadas. (d) Bimal eats 2 vadas. 100. Which of the following statements is true? (a) Mukesh eats 8 idlis and 4 vadas but no chutney. (b) The person who eats 5 idlis and 1 vada does not take chutney. (c) The person who eats equal number of vadas and idlis also takes chutney. (d) The person who eats 4 idlis and 2 vadas also takes chutney. DIRECTIONS for Questions 101 and 102: Answer the questions on the basis of the information given below. The perfume is priced at 520 Bahts per bottle. After one bottle is purchased, subsequent bottles are available at a discount of 30%. Three friends S, R and M together purchase three bottles of the perfume, agreeing to share the cost equally. R pays 2 Euros. M pays 4 Euros and 27 Thai Bahts and S pays the remaining amount in US Dollars. 101. How much does R owe to S in Thai Baht? 102. How much does M owe to S in US Dollars? DIRECTIONS for Questions 103 and 104: Answer the questions on the basis of the information given below. New Age Consultants have three consultants Gyani, Medha and Buddhi. The sum of the number of projects handled by Gyani and Buddhi individually is equal to the number of projects in which Medha is involved. All three consultants are involved together in 6 projects. Gyani works with Medha in 14 projects. Buddhi has 2 projects with Medha but without Gyani, and 3 projects with Gyani but without Medha. The total number of projects for New Age Consultants is one less than twice the number of projects in which more than one consultant is involved. 103. What is the number of projects in which Gyani alone is involved? (a) Uniquely equal to zero. (b) Uniquely equal to 1. (c) Uniquely equal to 4. (d) Cannot be determined uniquely. 104. What is the number of projects in which Medha alone is involved? DIRECTIONS for Questions 105 to 110: Answer the questions independently of each other. 106. When the curves y = log10x and y = x–1 are drawn in the x-y plane, how many times do they intersect for values x ≥ 1 ? 108. Which one of the following conditions must p, q and r satisfy so that the following system of linear simultaneous equations has at least one solution, such that p + q + r ≠ 0? The total time available on machine A is 700 hours and on machine B is 1250 hours. Among the following production plans, which one meets the machine availability constraints and maximizes the profit? 110. The sum of 3rd and 15th elements of an arithmetic progression is equal to the sum of 6th, 11th and 13th elements of the same progression. Then which element of the series should necessarily be equal to zero? DIRECTIONS for Questions 111 to 113: Answer the questions on the basis of the information given below. A city has two perfectly circular and concentric ring roads, the outer ring road (OR) being twice as long as the inner ring road (IR). There are also four (straight line) chord roads from E1, the east end point of OR to N2, the north end point of IR; from N1, the north end point of OR to W2, the west end point of IR; from W1, the west end point of OR, to S2, the south end point of IR; and from S1 the south end point of OR to E2, the east end point of IR. Traffic moves at a constant speed of 30π km/hr on the OR road, 20π km/hr on the IR road, and 15√5 km/hr on all the chord roads. 112. Amit wants to reach N2 from S1. It would take him 90 minutes if he goes on minor arc S1 – E1 on OR, and then on the chord road E1 – N2. What is the radius of the outer ring road in kms? 113. Amit wants to reach E2 from N1 using first the chord N1 – W2 and then the inner ring road. What will be his travel time in minutes on the basis of information given in the above question? DIRECTIONS for Questions 114 to 120: Answer the questions independently of each other. 115. Twenty-seven persons attend a party. Which one of the following statements can never be true? (a) There is a person in the party who is acquainted with all the twenty-six others. (b) Each person in the party has a different number of acquaintances. (c) There is a person in the party who has an odd number of acquaintances. (d) In the party, there is no set of three mutual acquaintances. 118. How many even integers n, where 100 ≤ n ≤ 200 , are divisible neither by seven nor by nine? 120. In a 4000 meter race around a circular stadium having a circumference of 1000 meters, the fastest runner and the slowest runner reach the same point at the end of the 5th minute, for the first time after the start of the race. All the runners have the same starting point and each runner maintains a uniform speed throughout the race. If the fastest runner runs at twice the speed of the slowest runner, what is the time taken by the fastest runner to finish the race? DIRECTIONS for Questions 121 to 125: Each question is followed by two statements, A and B. Answer each question using the following instructions. Choose (3) if the question can be answered by using both the statements together, but cannot be answered by using either statement alone. Choose (4) if the question cannot be answered even by using both the statements together. 121. Is a44 < b11, given that a = 2 and b is an integer? 122. What are the unique values of b and c in the equation 4×2 + bx + c = 0 if one of the roots of the equation is (–1/2)? A. The second root is 1/2. B. The ratio of c and b is 1. 123. AB is a chord of a circle. AB = 5 cm. A tangent parallel to AB touches the minor arc AB at E. What is the radius of the circle? 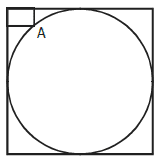 A. AB is not a diameter of the circle. B. The distance between AB and the tangent at E is 5 cm. 125. 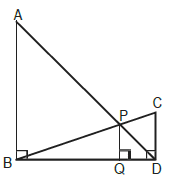 D, E, F are the mid points of the sides AB, BC and CA of triangle ABC respectively. What is the area of DEF in square centimeters? B. Perimeter of ABC = 6 cm, AB = 2 cm, and AC = 2 cm. DIRECTIONS for Questions 126 to 150: Answer the questions independently of each other. 126. At the end of year 1998, Shepard bought nine dozen goats. Henceforth, every year he added p% of the goats at the beginning of the year and sold q% of the goats at the end of the year where p > 0 and q > 0. If Shepard had nine dozen goats at the end of year 2002, after making the sales for that year, which of the following is true? 129. Let p and q be the roots of the quadratic equation x2 – (a – 2) x -a – 1 = 0 . What is the minimum possible value of p2 + q2? 131. Let a, b, c, d be four integers such that a+b+c+d = 4m+1 where m is a positive integer. Given m, which one of the following is necessarily true? 133. 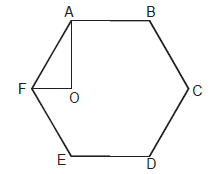 In the figure below, ABCDEF is a regular hexagon and ∠AOF = 900 . FO is parallel to ED. What is the ratio of the area of the triangle AOF to that of the hexagon ABCDEF? 134. How many three digit positive integers, with digits x, y and z in the hundred’s, ten’s and unit’s place respectively, exist such that x < y, z < y and x ≠ 0 ? 142. In the figure below, the rectangle at the corner measures 10 cm × 20 cm. The corner A of the rectangle is also a point on the circumference of the circle. What is the radius of the circle in cm? 143. Given that -1 ≤ v ≤ 1, -2 ≤ u ≤ -0.5 and -2 ≤ z ≤ -0.5 and w = vz / u , then which of the following is necessarily true? Which of following statements is true for x2 ≤ x ≤ 2 ? (a) The two curves intersect once. (b) The two curves intersect twice. (d) The two curves intersect thrice.